The Sickle, on Mt. Moran's northeast face, is a steep, exposed line on one of the most iconic peaks in Grand Teton National Park. TGR photo. 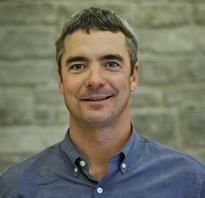 UPDATE Wednesday, May 20th, 10:30 AM MST: We have just received reports that Stephen Adamson, Jr., who was critically injured in Sunday's avalanche on The Sickle on Mt. Moran, has succumbed to the injuries he sustained in the slide. Adamson was airlifted following the avalanche Sunday to the Jenny Lake Rescue Cache before being transported to Jackson Hole Airport and then flown in an air ambulance to Eastern Idaho Medical Center in Idaho Falls, Idaho. According to a Facebook post put out by Stephen's wife, Sara Scott Adamson, this morning, Stephen passed with family by his side last night around 10:30: "It breaks my heart to tell you that Stephen Adamson died last night around 10:30. It was very peaceful, and he was surrounded by family. We have been comforted by something the neurosurgeon told us, which is that he really believes that Stephen left us on the mountain." Stephen was an experienced backcountry skier and worked in Jackson as a lawyer focusing on estate and tax planning at Gonnella Adamson, PC. 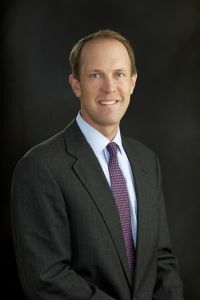 Stephen also served as a Director and Treasurer of the Center for the Arts, a cultural and arts center located in Jackson, and as a Trustee of the National Museum of Wildlife Art. Our thoughts and prayers are with Sara, the couple's children and family, and the many friends now grieving over the loss of a good man. We are deeply saddened to be reporting on the death of Jackson Hole local Luke Lynch, 38, who died in a wet slough avalanche on Mt. Moran in Grand Teton National Park yesterday. According to the National Park Service , Lynch was climbing up the steep, exposed line known as The Sickle on the northeast face of Mt. Moran early yesterday morning with three others when a shallow wet slough avalanche released from above the party. The slide swept three of the party 500 feet down the line and over sections of ice and exposed rock. The avalanche killed Lynch while leaving one of his partners, Stephen P. Adamson, Jr., 42, critically injured and in need of immediate medical attention. Brook Yeoman, 37, sustained minor injuries in the slide as well. Exum Mountain Guide Zahan “Z” Billimoria, one of TGR’s go-to guides for the Tetons and who was the only one of the party to escape the initial slide, was reported to have performed heroically in the aftermath of the incident, at first calling 911 and rushing to administer first aid to his injured partners and then, as fresh snow continued to send small sloughs down on top of the group, working to move Adamson and Lynch out of the path of the falling snow and into safety as Yeoman descended slowly under his own power despite his injuries. A Teton County SAR helicopter piloted by Nicole Ludwig was eventually able to make multiple trips to the scene of the incident to support the evacuation of victims. Eric Helgoth photo via Teton County SAR. 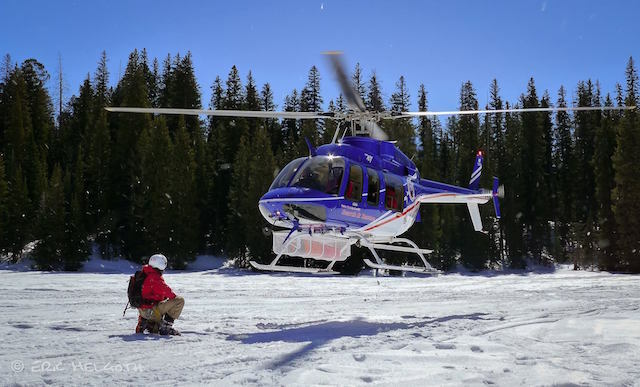 A brief break in the weather allowed a Teton County Search and Rescue helicopter to arrive at the base of the couloir and short-haul in a SAR rescuer, who arrived on the scene to attend to Adamson, who was already being attended to by Park Rangers who had arrived on foot. Adamson was airlifted first to the Jenny Lake Rescue Cache before being eventually flown in a fixed-wing aircraft to receive additional treatment at Eastern Idaho Medical Center in Idaho Falls, Idaho. 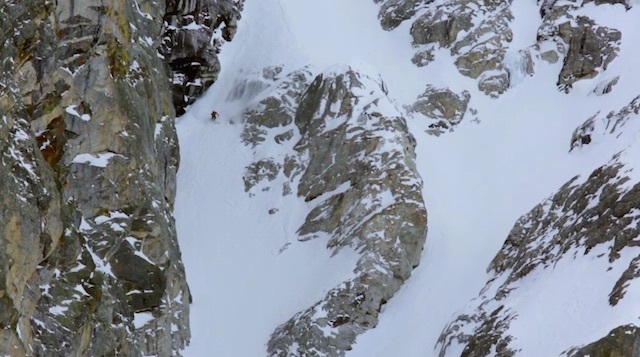 The SAR helicopter returned to retrieve Billimoria and Yeoman from the mountain before subsequent flights were made to retrieve Lynch’s body and the remaining rescue staff, all of whom were off of the mountain by 3 p.m.
Max Hammer negotiating the narrow rocky crux of The Sickle while filming with TGR in 2014. Above is 2000' of 45 degree terrain. TGR photo. 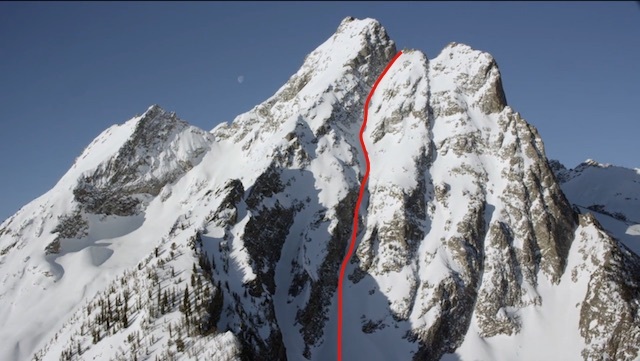 The Sickle is one of the prime extreme ski mountaineering objectives in all of the Tetons, hidden away on Mt. Moran’s northeast face and often in the shadow of the main face and its more obvious Skillet Glacier route. The top of the route consists of 2000’ of sustained 45 degree pitch before choking into two parallel cruxes littered with ice and rock that require a good snow year to navigate on skis without rappelling. A cycle of cold and wet weather patterns circulating through the Tetons this May had been bringing cold temps and fresh snow to Mt. Moran over the course of the weekend; the summit of Jackson Hole Mountain Resort, roughly 2,000 vertical feet lower than the summit of Mt. Moran and 17 miles to the south, had received ten inches of fresh snow between Friday and Sunday. While the end of the avalanche hazard forecasting season for the Bridger-Teton Avalanche Center meant no avalanche advisory was available, fresh snow and wet slides were undoubtedly a factor on the day of the incident. Luke Lynch was a resident of Jackson and the Wyoming director of the Conservation Fund , whose state branch he founded in 2006 and which has worked to preserve 150,000 acres of wild lands and important habitat across the state since its founding. An active member of the Jackson Hole community, Lynch also served on the Advisory Board of Friends of Pathways, was a Senior Advisor to the Ruckelshaus Institute of Environment & Natural Resources at the University of Wyoming, was on the Advisory Council of the Wyoming State Forestry, was a past founding director of the Green River Valley Land Trust, and was a 2012 recipient of the Public Lands Stewardship Award from the Public Lands Foundation. "Luke was a wonderful person," said Andy Schwert, a Jackson local who knew him for the past two decades growing up in Milwaukee together and then both winding up in the Tetons. "Everyone who knew him always had positive things to say about him. He made people smile, especially his kids, whenever he was present. The world lost a talented, dedicated family man who just happened to be a one of the Tetons' top ski mountaineers. I feel privilaged to have known him." Luke is survived by his wife and family, and our thoughts are certainly with them in this dark, difficult hour. We will update this article as more details become available. In the meantime, we'd like to thank those who assisted in the rescue operation for their heroic efforts to bring the party back down to safety. That’s a proud line. RIP.